Nokia has designed an interactive video conferencing robot that can be controlled through its N800 internet tablet. Although still a concept, the robot – dubbed Jeppe – has been designed to explore how people react to different forms of video conferencing hardware to traditional PC webcams. Nokia hasn’t said much about the technology inside Jeppe yet, but has confirmed that behind the cold, plastic façade is a two-way video camera, sound sensor and digital compass. 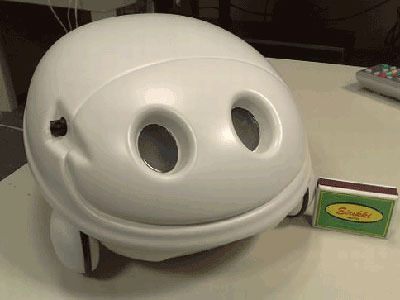 Jeppe also contains a “mash-up” of existing technologies, such as Bluetooth, and the “brain box” from a Lego NXT robot. The N800’s directional keypad enables the user to steer Jeppe around, suggesting that Jeppe could be used to, say, remotely check that your house hasn’t been invaded while you're away on holiday. Six pre-defined gestures, also accessed through the N800, trigger certain responses in Jeppe. But Nokia hasn’t said much about these yet, either. Video conferencing chats are conducted in real time using GoogleTalk. Jeppe was created by Nokia’s Research Centre Smart Spaces lab, which studies remote management and “smart” technologies. The lab plans to expand Jeppe’s connectivity options so that it can be controlled through the internet too, whilst also enabling it to move independently. Store closures on the way? Did someone mention Brexit?